Are you someone who grinds their teeth at night? Sometimes we don’t even know we’re doing it until we wake up with a sore jaw or our partner tells us. Stress-related teeth grinding is VERY common. In fact, studies have shown that 70 percent of us clench and grind our teeth as a result of stress and anxiety! At Sugar Fix Dental Loft, we see many patients who struggle with both stress and anxiety, and we have seen what long-term teeth grinding can do. That’s why we wanted to put together a blog post to educate other people who are dealing with this issue! Some research has shown a potential link between stressful work environments and teeth grinding, but it isn’t just job stress that leads to bruxism (the clinical term for teeth grinding). All sorts of life stresses and anxieties can lead this behavior. It is important that you address any issue that is leading to negative health issues, such as teeth grinding, as soon as you are able. Stress-related teeth grinding can not only damage the surface of the tooth, it can lead to other unpleasant side-effects as well. The Bruxism Association found that people who grind their teeth are 3x more likely to suffer from headaches. You may also experience ear pain or other facial pain. Your teeth might feel more sensitive or you may have a filling or even a tooth crack or break! Obstructive Sleep Apnea – If you snore or have a sleep disorder like sleep apnea, you’re much more likely to grind your teeth at night. Certain Medications – If you take certain medications, e.g. SSRIs, you might deal with teeth grinding as a side-effect. Lifestyle Choices – Smoking, drinking, excess caffeine, and recreational drug use can cause teeth-grinding. 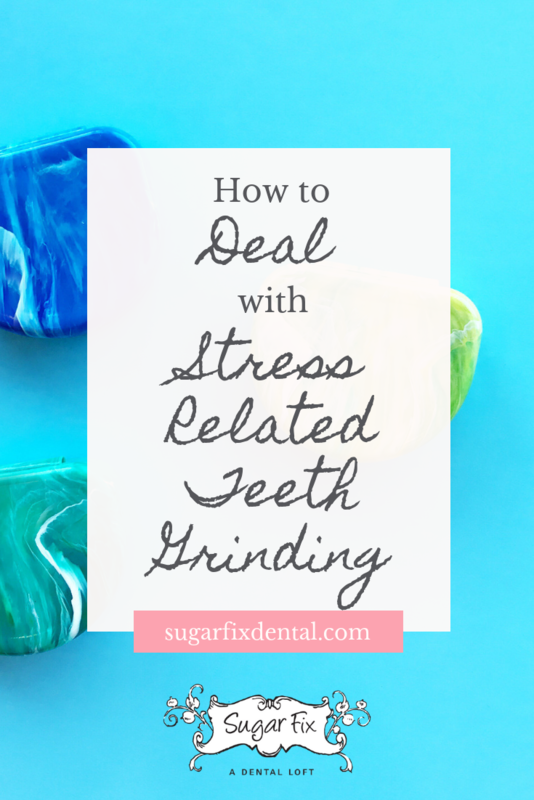 How Do I Stop Stress-Related Teeth Grinding? The best way to protect your teeth is by wearing an appliance over your teeth while you sleep. They go by lots of different names, but basically what we’re referring to is a custom-made plastic mouth pieces that fits over either your top or bottom teeth. This will prevent your teeth from becoming damaged while you sleep. Some people have found success by practicing muscle relaxation exercises before bed. Seeing a therapist for the stress or anxiety issues is also a great idea. It can really make a difference not just with teeth grinding, but with all of the other aspects of your life that are being affected. If you’re curious about whether your teeth are becoming damaged due to stress-related teeth grinding, or you want to get a mouthguard to protect your teeth, we can certainly help! You can reach us at 773-883-1818 or you can schedule a consultation or appointment on our website by clicking here!